We just celebrated our 1st anniversary of owning our house! When we purchased the house, it had been divided into a duplex by walling up the stairs and breaking up the natural flow between floors. Creating a 3 bedroom apartment upstairs and a 2 bedroom apartment downstairs. 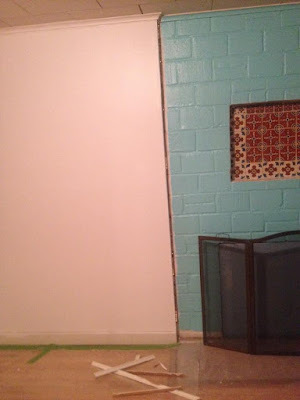 When I realized this, just after I had finished painting the fireplace, and saw light coming through from an unfinished part of the wall, I called Sean excitedly and said, "I'm going through that wall!!" This is where I noticed the light coming through and I took this pic the moment I decided I was going through it! This is when we went through the wall finally. Glad I waited for some help! 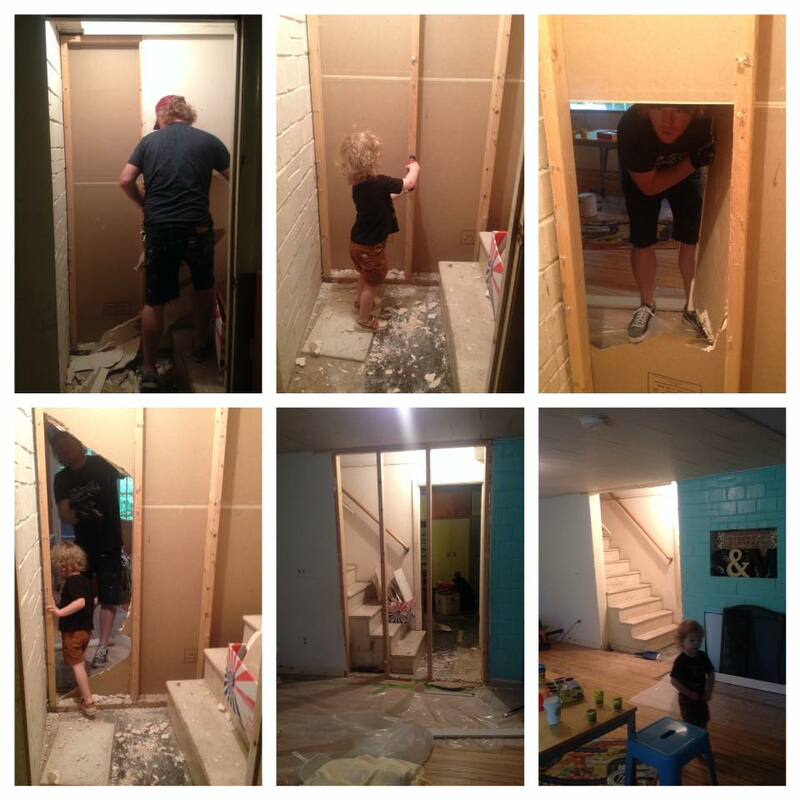 After we took the wall down, it really opened up the space and suddenly the whole house floor plan made sense. Re-opening that staircase really married the two stories and gave us one cohesive house instead of two separate apartments. I was thrilled! But I was not thrilled with the state of the stairs. They had been hidden behind a narrow passageway, with no electricity for who knows how many years. (I actually installed the lights and the switch myself after taking a Home Depot class). So once it was opened up and there was light on it, it was clear how severely they needed a coat of paint. 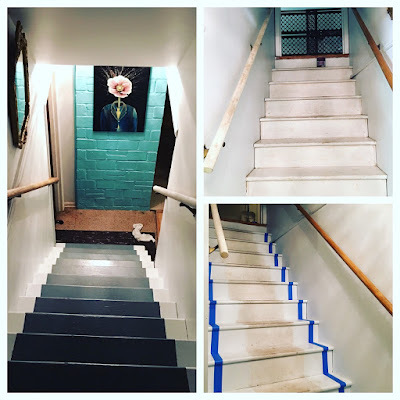 I spent an evening painting the stairwell and even priming the stairs, but with kids and pets and a million other things needing to be done, the stair makeover ended at that point. 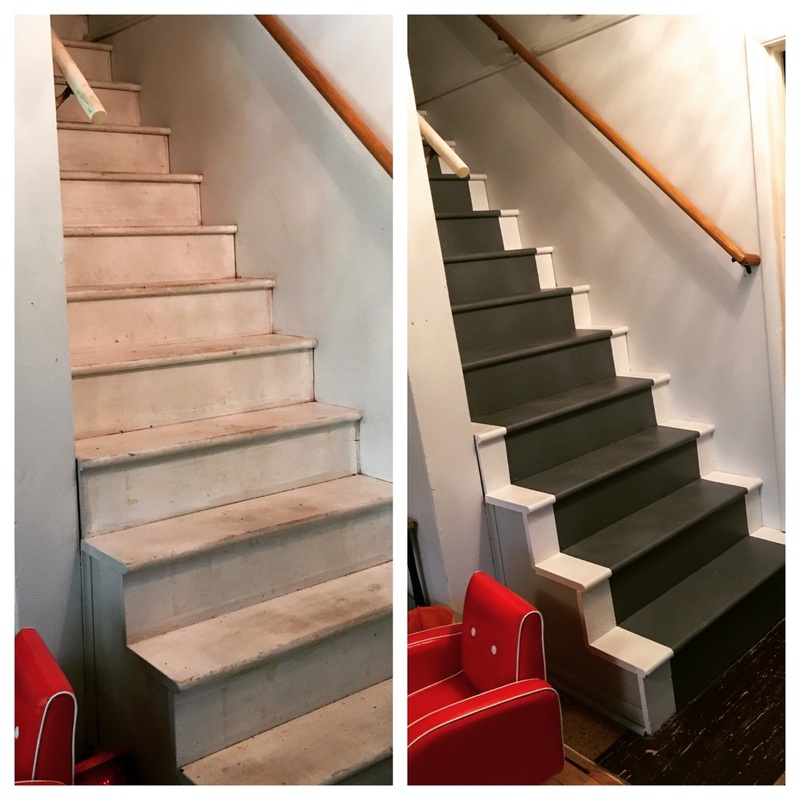 So for a year, the stairs have just been covered in primer, and being a high traffic area, turned a very nasty shade of dirty, no matter how much I swept and vacuumed them. I had a house with no kids for a few hours today and decided I would just go for it, and finally get these things done! I could not be more pleased with the results! 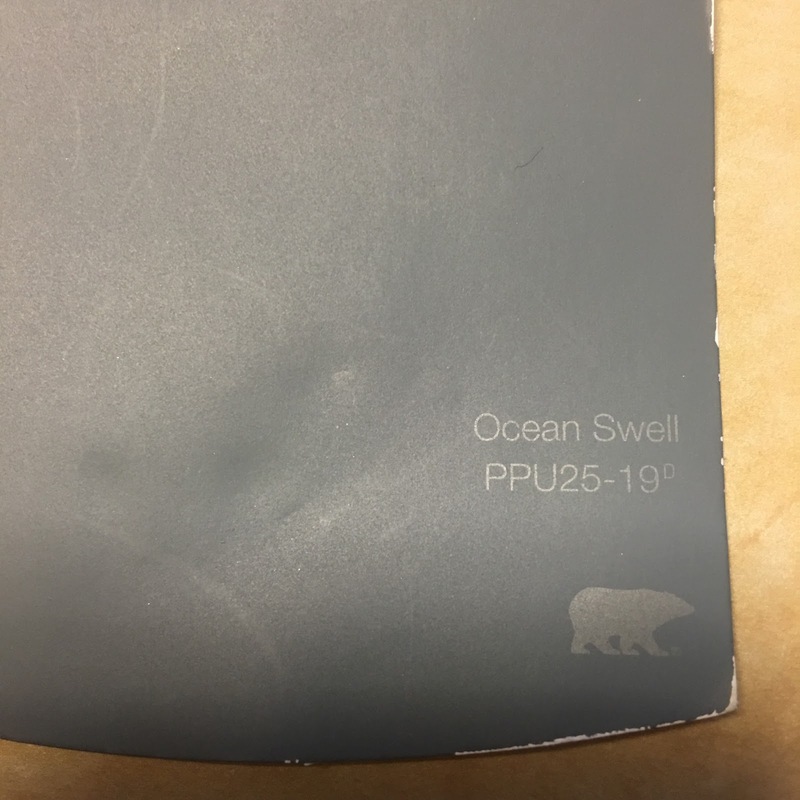 I painted both sides of the stairs in the same color as the walls, then I taped off the part that I was going to paint the Ocean Swell color. I liked how it creates a runner look. Initially I was going to do the entire stair a color, but after a lot of research I feel this was a more finished/polished look. I took the finished photo at nearly 1AM, and did not want to disturb the wet paint, that is why my paint rag is still at the bottom of the stairs. My next project is to cover that gross tile at the bottom of the stairs with something amazing!! Stay tuned!